The Sunday Times, which reported that up to 11 cabinet minister confirmed they wanted the prime minister to make way for someone else, said that at six senior ministers want her deputy, David Lidington, to deliver Brexit and then make way for a full leadership contest in the autumn. Lidington’s supporters include cabinet remainers Greg Clark, Amber Rudd and David Gauke. The chancellor, Philip Hammond, also believes Lidington should take over if May refuses this week to seek a new consensus deal on Brexit. Sajid Javid, has agreed to put his own leadership ambitions on hold until the autumn to clear the way for Lidington — as long as his main rivals do the same. The relatively unfamiliar - especially outside the UK - Lidington "is understood not to be pressing for the top job but is prepared to take over if that is the will of cabinet. He would agree not to stand in the contest to find a permanent leader." Lidington’s friends want him to pledge to allow the cabinet to decide Brexit policy in order to get Hunt and Gove on board, urging the three cabinet heavyweights to work together to take control of the government. Michael Gove, a leading Brexiteer in the 2016 referendum, and Foreign Minister Jeremy Hunt also have some support. Hunt, the foreign secretary, does not support Lidington because he believes he would do a deal with Labour to take Britain into a permanent customs union with the EU, although he has lost confidence in May’s ability to take advice or deliver the deal. Meanwhile environment secretary Gove has a leadership team in place and a raft of supporters who have been recruited in a series of secret dinners hosted by Mel Stride, the Treasury minister. Gove is said to be ready to support Lidington if others do but is sceptical that agreement will be reached. As the Times details, the coup erupted "after a week of mistakes" by May, who delivered a television statement that alienated the MPs whose support she needs for her Brexit deal and then flirted with backing a no deal before performing a U-turn. Similar to recurring mentions of the 25th Amendment in the US, concerns about May’s mental and physical resilience are widely shared. Officials in parliament were so concerned about May’s welfare they drew up a protocol to extract her from the Commons if she collapsed at the dispatch box. For now May has refused to comply with the coup's demands, and the Times sources at Downing Street say May has not yet come to the conclusion that she should resign and is still being encouraged by her husband Philip to fight on. But she has also lost the confidence of key allies whose job it is to maintain party discipline. Whether she remains or quits, the current Brexit process remains irreparably broken: Julian Smith, the chief whip, believes there is no prospect of the prime minister winning support for her deal unless she announces that she is standing down so the second phase of Brexit negotiations can be conducted by a new leader. But Smith and other senior Tories believe that May’s resignation is a prerequisite to securing the support of key Brexiteers Boris Johnson, Dominic Raab and Jacob Rees-Mogg for the deal — without whom it is doomed to defeat. In a desperate last ditch move to save her seat, May’s team is said to be working on a plan to secure the support of the Democratic Unionist Party and Labour MPs by granting them a say on the final trade deal, to be negotiated after Brexit. That appears to be too little, too late: MPs claimed that just one member of the whips’ office, Mike Freer, wants May to carry on. In an astonishing challenge to her authority one senior whip, Paul Maynard, told May to her face that she should go because she was “betraying Brexit” and “destroying our party”. Sir Graham Brady, the chairman of the 1922 committee of backbenchers, is “at the end of his chain” and also thinks May should resign. Meanwhile, in bad news for pound bulls, with May’s authority in freefall, Times sources said it is unlikely that the prime minister will hold a third meaningful vote on her Brexit deal this week. Instead she will be a passenger as MPs vote tomorrow on a motion that will let them seize control of Wednesday’s Commons business to host a series of “indicative votes”, where MPs can express a preference for alternatives to May’s Brexit plan. That could lead to pressure for a new referendum or a Norway-style deal that keeps Britain in the single market. The most likely outcome, however, is even more chaos and confusion as in addition to having no real Brexit plans ahead of the (extended) hard Brexit headline in three weeks, the UK will soon be without a real leader. are we really sure that it will be left to an “interim” PM to change direction of the county? 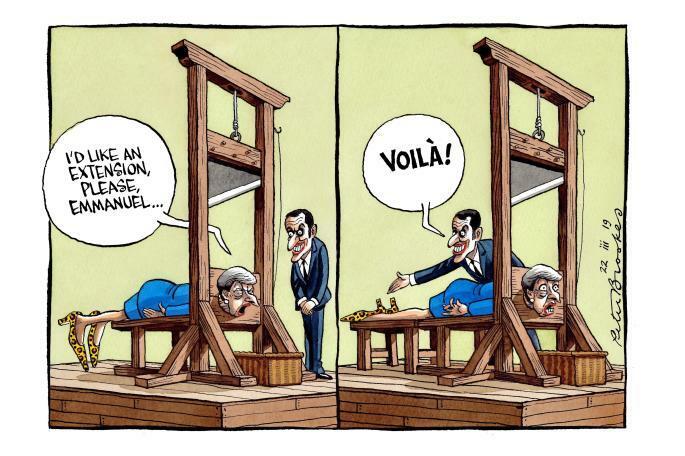 - are we really sure that it will be left to an “interim” PM to change direction of the county? The report of the political revolt comes, ironically, just hours after hundreds of thousands of Britons poured into the streets of London demanding a second public vote. Marchers, accompanied by live performances from noted U.K. musicians including DJ Fatboy Slim, clogged the streets of central London as they walked from Hyde Park to Parliament Square to hear from the opposition Labour Party mayor of London, Sadiq Khan, Scottish First Minister Nicola Sturgeon and deputy Labour leader Tom Watson. Watson promised to back Theresa May’s twice-defeated political deal -- breaking from the party’s position -- in return for her agreement to put the withdrawal accord to a public vote. “I will support your deal, I will help you get over the line, to help avoid a disastrous no-deal Brexit, but only if you let the people vote on it,” Watson said. And while most of the attendees favor Britain staying in the bloc, the rest of the UK reportedly remains sternly against going back to that other vortex of political chaos known as the European Union. 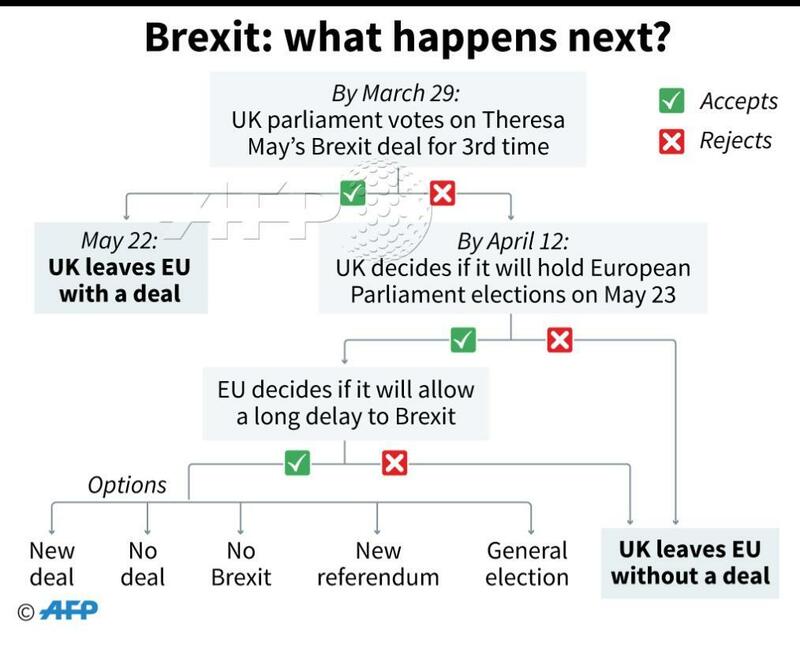 Appendix: for those who still pretend to bother about the Brexit process and where we currently stand, the following flowchart from AFP should give you a rough idea.